2011’s French dramedy The Intouchables was a massive hit in both its native country and all across Europe, so it was only a matter of time for an American version to hit theaters—seven years later, but better now than never? Based loosely on a real story about the unlikely friendship between a Caucasian quadriplegic aristocrat and his ex-con Arab-French caretaker, the original was a charming but cheesy inspirational workplace poster of a movie, offering an almost unbearable overload of schmaltz counterbalanced with some genuine, lighthearted humor. The remake, The Upside, sticks fairly close to the tone and structure of the 2011 film, and therefore adopts most of what worked and didn’t land, albeit being a slight improvement on some fronts. The Intouchables changed the caretaker from Middle Eastern to Black, in the form of a star-making turn by then newcomer Omar Sy. As much as Sy carried his part, thanks mostly to his natural charisma and bountiful positive energy, his character didn’t have much depth or purpose beyond acting as the emotional savior of the sad billionaire he was tasked to care for, a ballpark adjacent of the “Magical Black Man” trope. Jon Hartmere’s screenplay for The Upside ratifies this by giving the caretaker, played this time by Kevin Hart as Dell, his own personal conflict to overcome. Dell’s a sly, enamoring presence, but also a chronic fuckup who’s trying desperately to set things straight so he can become a more supportive presence for his estranged son (Jahi Di’Allo Winston) and make up for years of disappointment to his emotionally exhausted ex-wife (Aja Naomi King, a formidable presence in such a small role). On his quest to gather participation signatures from employers to prove that he’s looking for work so he can satisfy his parole officers, Dell is unexpectedly hired as a caretaker for Phillip (Bryan Cranston), the aforementioned billionaire quadriplegic. Understandably depressed after losing movement below the neck and losing his wife to cancer, Phillip’s plan is to essentially commit suicide by employing the obviously underqualified Dell, so that in an emergency there will no one to save him. Yet not only does Dell prove himself to be decent at his job, but also pulls Phillip out of his funk by showing him that there are still a lot of things in life to enjoy. Some of these “things” are expressed in the forms of lazy gags, like Dell making Phillip smoke weed, giggle uncontrollably and order 15 hot dogs. But some moments are genuinely heartfelt, like the way the two bond over their love for opera and classic R&B, resulting in a tear-jerking climax where the two genres beautifully (if predictably) come together. The Intouchables was about how, no matter how dire things can become, life can always provide second chances. But this theme was primarily reserved for the billionaire. We get more of a balanced approach in The Upside, as Dell’s yearning for a second chance with his family goes hand in hand with Phillip’s journey of newfound joy. 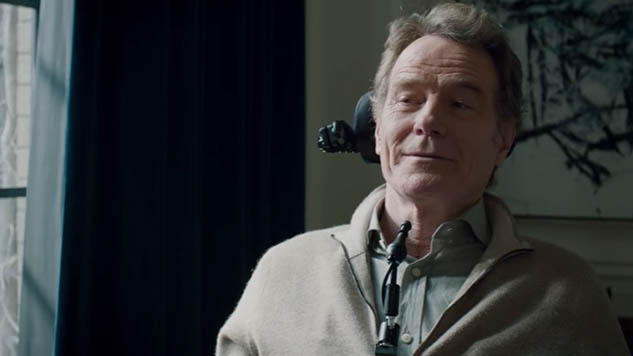 Once the friendship between Dell and Phillip is established early on, The Upside hits the same narrative wall that The Intouchables did, mainly that it tries too hard to manufacture conflict. The second act break, the traditional spot in most screenplays where everything becomes bleakest for the protagonists, has to have Phillip act wholly uncharacteristically in order to facilitate a dramatic rift. It’s also resolved as sloppily as it’s introduced. A premise like this soars or crashes on the chemistry between the two leads. Hart’s indelible magnetism goes matches well with Cranston’s no-nonsense but naturally inviting presence. Appropriately, director Neil Burger and cinematographer Stuart Dryburgh use a lot of run-and-gun photography to capture various moments of improvisation between Hart and Cranston, resulting in that shiny and somewhat blurry digital look, as if some shots were achieved using GoPro or even an iPhone. Still, they capture some natural and hilarious banter between the two leads. It’s endearing to see Burger change his typically harsh tone to create a story awash with such positivity. And just like its French original, The Upside is fairly superficial, but warm enough for the studio dumping ground known as January. One could do a lot worse.